My Postcrossing profile says I like cute cats, so am not sure why I received this deadly snake. But, it is good to have your horizons expanded. Seek help immediately if you are ever bitten. This guy is not a favorite of mine. 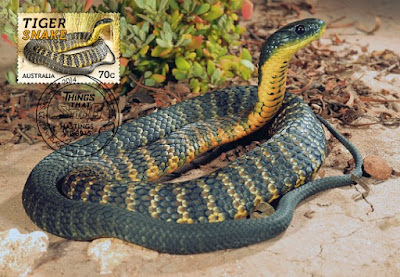 Hope only to come across one of these snakes in photos and on stamps. well, here you go... no need for other sightings! Tigers are cats. I guess that's the link with this fearsome looking creature. Hmmm... well you'll know what to do if you ever encounter one! Australia has a surprisingly high number of dangerous animals.